It's Friday! 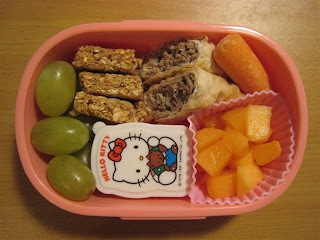 Last bento of the week, unless I feel inspired and make them over the weekend. If you've been following my blog at all, you'll realize that although I say it, it isn't rather likely. ;o) Weekends are relax around the house and do nothing kind of days around here. But until that point, Faith had one more day left of school, her Friday electives. She only has morning classes, but likes to stay for lunch with her friends. She has one of the leftover boureks (cut in half to fit in her box), vanilla yogurt in the HK container, a couple of baby carrots, a granola bar (cut in thirds to fit), the rest of the canteloupe and the rest of the grapes. The fridge clean out last night yielded a full lunch.